First used as a means of travel in the Androscoggin Valley area, cross-country skiing became a popular racing sport and recreational activity. The country’s oldest continuously organized ski club, the Nansen Ski Club, is based in Berlin. Founded in 1872, the Nansen Ski Club offers more than 15 kilometers (km) of groomed trails at Milan Hill State Park, and easy access to 300km of nearby groomed ski trails. Consider the area’s cross country skiing history as you enjoy the beautiful views. Then unwind in the Nansen Ski Club’s new beautiful timber-framed warming hut. Bretton Woods Nordic Ski Center has 100 km of groomed trails that meander through field and forest, and — with the Mount Washington range as a backdrop — boast stunning scenery! The variety, beauty, and serenity of our cross-country ski trails are unparalleled. Plan your visit today! 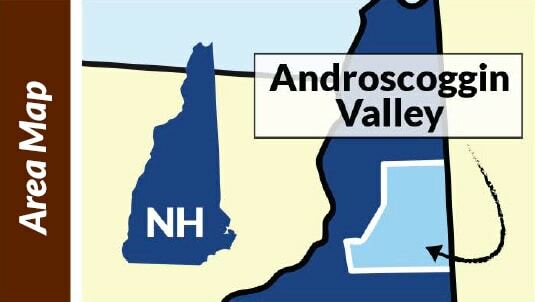 Located just 30 minutes from Jackson, NH and less than an hour from North Conway and Lincoln, the Androscoggin Valley is nestled amidst two of New Hampshire’s most scenic regions – the White Mountains and the Great North Woods on the northern side of Mt. Washington and the Presidential Range. The area offers a variety of activities and attractions throughout the four seasons. Start planning your trip now!